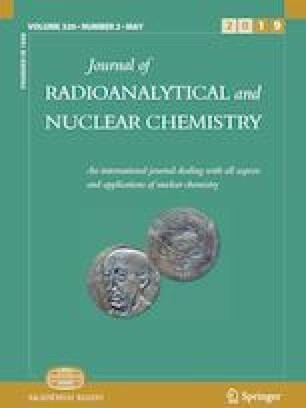 The use of commercially available strontium-selective resins has been established for strontium isolation and the analysis of radiostrontium. The resins show no significant aging effects (during storage under different temperatures) and even long-time storage under highly acidic conditions yields a similar performance to new resin columns. The reuse of the SR Resin after storage under acidic conditions and the complexing agent oxalic acid showed detrimental effects. Lastly, the reusability of the resins is limited due to a residual 0.5% of the initial radiostrontium activity on the column, even after multiple pure water elutions. The impact of the radiotracer 85Sr on low-level LSC measurements of 90Sr was tested. The online version of this article ( https://doi.org/10.1007/s10967-019-06484-y) contains supplementary material, which is available to authorized users. A.W. gratefully acknowledges financial support by the Deutsche Bundesstiftung Umwelt (DBU) in the form of a Promotionsstipendium (No. 20017/484). F.K. thanks the Siebold-Sasse-Stiftung for financial support.